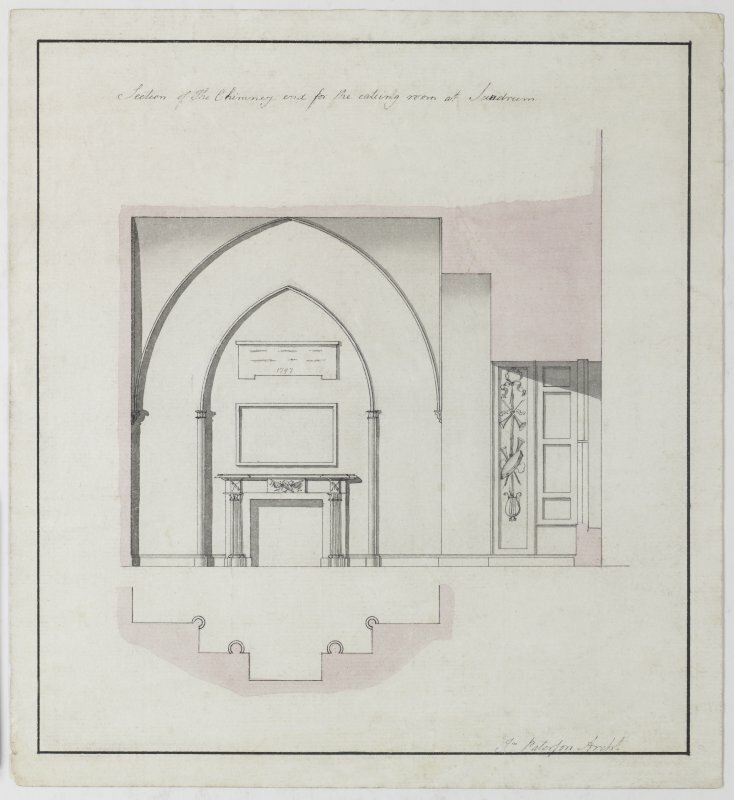 Digital copy of a design for the remodelling of the Eating Room at Sundrum Castle, Ayrshire. 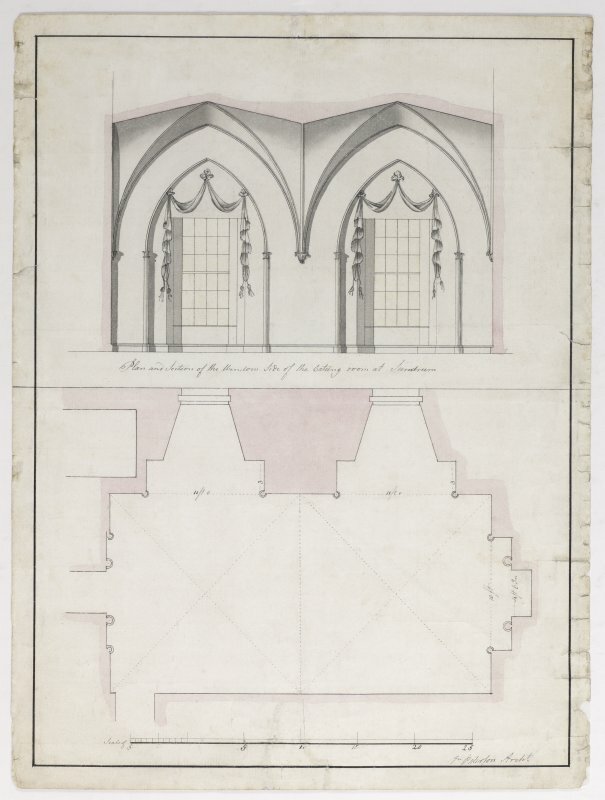 Insc:'Plan and Section of the Window Side of the eating room at Sundrum' s:'Jn Paterson Archt.' Annotated on panel above chimneypiece:'1797' Purchased with the assistance of the Art Fund, 2011. Digital copy of a design for the remodelling of the Eating Room at Sundrum Castle, Ayrshire. 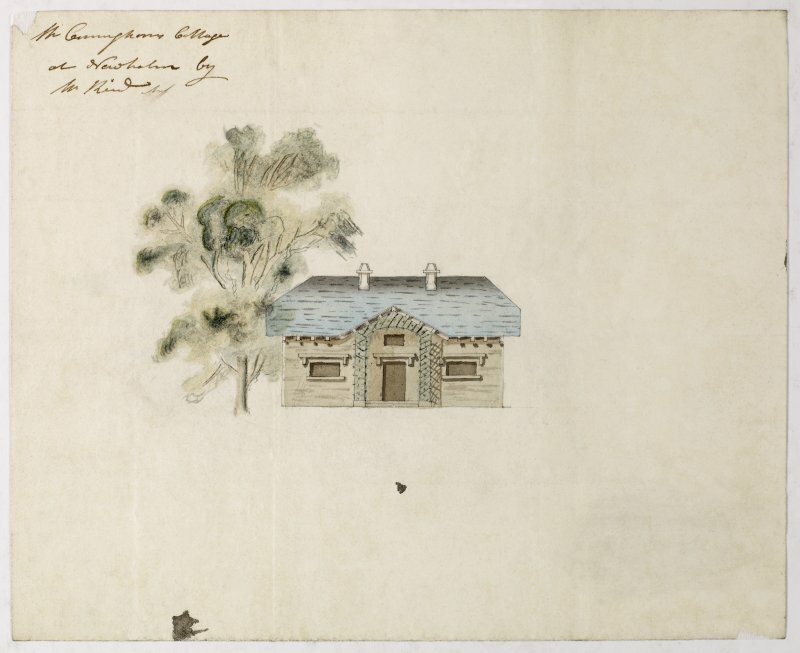 Insc:'Section of the chimney end for the eating room at Sundrum' s:'Jn Paterson Archt.' Annotated on panel above chimneypiece:'1797' Purchased with the assistance of the Art Fund, 2011. Most of the building now known as Sundrum Castle Hotel was built about 1792, incorporating an earlier tower, with walls 10ft thick, which the hotel brochure states is of 14th century date. The first historical name associated with it is Sir Duncan Wallace, mentioned in 1373. NSA 1845; A H Millar 1885; (undated) Hotel Brochure. Name confirmed as 'Sundrum Castle Hotel' (R J Dronsfield, manager) this relatively modern building incorporates a large, considerably restored, rectangular tower-house at its E end. The walls are extremely thick, and it bears evidence of having been a very early structure. The whole is in excellent condition and in use as a hotel. Sundrum Castle Hotel is as described. The latest brochure states that the tower dates back to 1160. Sundrum Castle, a listed building largely of late 18th-and-19th century date, stands amid wooded policies on the edge of an escarpment overlooking the Wat er of Coyle. The earliest portion of the fabric appears to be the S side of the main block (erected about 1792) which incorporated an originally freestanding tower-house of probable late 14th-century date. Although the tower has been much altered by its inclusion in the later house, sufficient remains to indicate its essential character. It was oblong on plan (10.20m by 4.65m within walls 3m thick) and comprised at least three principal storeys with a vaulted basement and a high vault (at third floor level), possibly divided to provide an entresol. The principal entrance was probably at first-floor level, at the E end of the N wall, from where a straight stair descends to the basement. An arch-pointed doorway (mid-way up the lintelled stair passage) wrought with a broad chamfered arris, may have given access to an entresol or to a chamber created in the haunch of the ground floor vault. A turnpike stair (of which only a portion is visible), rising from first floor level, probably communicated ultimately with the wallhead. The first-floor hall was furnished with a fireplace in the W wall and mural chambers in the NW and SE angles (the latter entered off a window embrasure in the S wall); the doorway to the former is wrought with a broad chamfered arris. The recent removal of the harling from the front of the house has revealed a cut-back base-plinth at the foot of the S wall. In 1373 the barony of Sundrum was granted to Sir Duncan Wallace and Eleonora Bruce, Countess of Carrick, his wife. The estate subsequently passed to the Cathcarts and about 1762 to the Hamiltons. Visited by RCAHMS (IMS) September 1985.